Last week UK’s two time olympic medalist Nick Dempsy took on three other types of water craft, an Open 60, a Moth and a kiteboarder. This year because Sarah Hebert has an implantable defibrillator the French federation of sailing didn’t allow her to race. Anyway she was on the water and the starting boat and she made this nice video from the biggest windsurfing event in the World, the Defi Wind. Check out the 2013 Starboard Phantom 295, perfect for those into longboard course racing or a great cruiser at the cottage or lake. The new season for the Bic Techno 293 is about to begin, full of new friends, and new challenges! 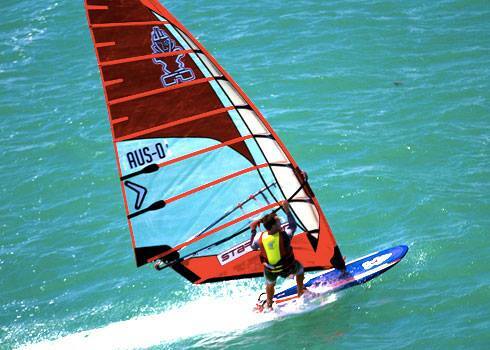 The Techno 293 is easy to sail, durable, and affordable, bring many new people into the sport of windsurfing. Find out more in this video and then head over to Techno293.org. Sean O’Brien the 6x Australian Formula Champion and Luke Baillie the 2012 RSX Australian Champion has joined forces to attack the 2013 PWA World Tour. We expecting some great updates from these guys throughout the season as the Cameras follow them as they travel and compete. You can follow them on there website at Team-Aus.com. For the racer who is looking at the lightest and potentially fastest TR-9, we are again offering a version using the well tested ODL04 Technora™ laminate. A significant modification to the body panel layout of the TR-9 XT locates materials in a way that best combines the “crisp” feel of monofilm in the lower body with the light weight and softness of Technora™ in the upper sail body and leech. Test results of the new layout have shown significant advantage over previous constructions. The 2012 Paracas Worlds took place from Decemeber 17th – 22nd, on the Bay of Paracas, which is located about 250kms South of Lima, Peru. Congratulations to Paulo Dos Reis (BRA 3333) who takes the title of 2012 Formula Experience World Champion. FE Masters Champion is Marcello Morrone (BRA 3), FE Youth Champion is Gabriel Bastos (BRA 127), FE Women’s Champion is Bruna Mello (BRA 49) and Alessio Botteri (PER 20) is the undisputed FE Junior Champion. Read additional racing info and check out pictures from the event at the official Formula Experience website here. Ricards to check out Formula. Windsurfing has been through ups and downs in recent years. End of the world predictions were almost truthful for Olympic windsurfing this year. There was a lot of discussions about why windsurfing should stay at the Olympics. Most probably the strongest argument in any discussion was the fact that BIC Techno 293 OD is the biggest windsurfing class in the world at the moment and future stars would be left without the future if windsurfing is not in RIO 2016. Here is the final video from the Phantom 295 event that was recently held at the King’s Cup Regatta in Phuket. The recap video shows all the best bits from the week including racing, beach activities, and much more. Strong winds gusting to 22knots delivered an exciting finale to the Phantom 295 Windsurfing event at the Phuket King’s Cup Regatta. Three races (7, 8 and 9) were held back-to-back on Kata Beach. Head over to Starboard and find out all the winners of the Kings Cup. King’s Cup Day 4 started with great planing conditions thanks to strong but gusty winds up to 25 knots. At times, the wind was even a bit too strong for some. With 4 races completed that day and 6 in total, it was the most successful day yet and the Phantom 295 riders got to experience the equipment in all conditions. Head over to Starboards website for a full report on day 4 with pictures.